A guide to resources on the subject of Medieval Scandinavian Law available throughout the Bodleian. If you would like some help with SOLO, please try the Libguide below - and/or have a chat with a librarian when next in the Law Bod! Unfortunately, very little written evidence survives from early medieval Scandinavia. As such, the majority of our knowledge of its legal traditions is based on later sources. The Forsa rune ring traditionally hung on the church door at Forsa in northern Sweden. It is an iron ring, approximately 15cm in diameter, engraved with a runic inscription which appears to detail the fines prescribed for failure to maintain a cult site. Through comparative runic chronology, the Forsa ring has been dated to c.800, making it the earliest written law in Scandinavia. Grágás is the name given to a set of laws believed to have governed the Icelandic Commonwealth before it fell under Norwegian rule. The laws are contained in two manuscripts, Konungsbók (GKS 1157 fol.) and Staðarhólsbók (AM 334 fol. ), both of which date to the later half of the 13th century. According to Íslendingabók,a 12th-centuy work by Ari Þorgilsson, the laws were originally recited at the yearly assembly, or Alþingi, by the Lawspeaker, an individual chosen from the ranks of the chieftains, over the course of the Lawspeaker's three-year tenure. In 1117, according to Ari, a new law was passed that the laws should be recorded in writing, and this was purportedly achieved the following winter by a committee of respected chieftains. Following the disintegration of the Commonwealth during the turbulent Sturlung Age, Iceland fell under the control of the Norwegian king. Magnus VI of Norway drew up a law code for Iceland entitled Járnsíða. This law code restructured the traditional Icelandic system of government, removing power from the goðar, and increasing the power of the Norwegian king. A copy of Járnsíða is available online, or from the English Faculty Library. 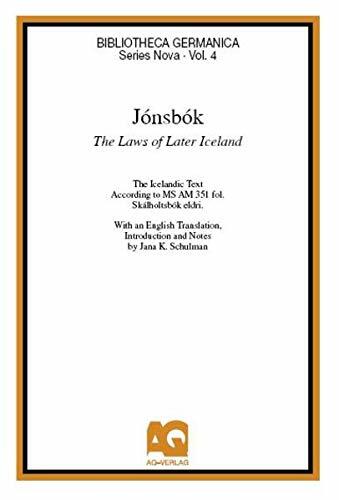 Jónsbók is a formal codification of the laws, written in 1281 by Jón Einarsson. It superseded the earlier Járnsíða code.